The plan is a contribution to the Alliance of Religions and Conservation (ARC)/UNDP programme for action plans from the major religions launched in November 2009 before the Copenhagen climate change meeting in December 2009. 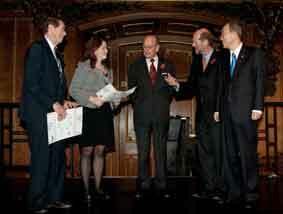 At the launch at a celebration at Windsor Castle on 2-4 November 2009, the BIC representatives Tahirih Naylor and Arthur Dahl (President of IEF) received certificates of appreciation from HRH Prince Philip and UN Secretary-General Ban Ki-moon (right ARC/Richard Stonehouse photo). More information on the event and summaries of the action plans are here and on the event web site (http://www.windsor2009.org/). The IEF is collaborating with the Bahá'í International Community on this project and is preparing materials in support of the action plan. See the climate change page.